First though, if you don’t know what Canva actually is, it’s a FREE online tool that allows you to create eye-catching graphics to use both offline and on. You can create a logo, a flyer, brochure, business cards, buttons for your website, web and social media headers and so much more! You can also use Canva to source images to use on your website and social media channels! …And did I mention, you can do all this for FREE? 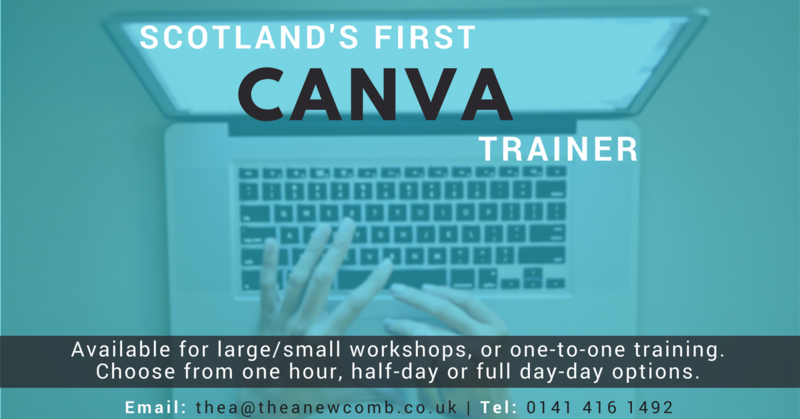 My first Canva course for 2018 is 22 February – Business Gateway Lanarkshire. This course is being held at Business Gateway’s Atrium Business Centre from 1:30pm-4:30pm. It is recommended that you bring your own laptop to this course as it’s an interactive training session. To book Creating Killer Graphics at Lanarkshire, go to this Events page on Business Gateway. The next Business Gateway Canva Workshop for 2018 will be held in Milngavie on 1 March. This will be my first time delivering a workshop in East Dunbartonshire (though have delivered the Canva training to the Business Gateway staff already). The event is 9:30am-12:30pm at Milngavie Enterprise Centre. Again you’ll want to bring your laptop as this course is practical. To book the March 1 workshop, please visit the Business Gateway Events page here. For those who can’t make day time events, you may be happy to learn that one is being held in the evening. Join me at 5pm on the 6th March, in Ayrshire at Greenwood Conference Centre, Dreghorn. At the moment this workshop is “Fully-booked” – so I would advise putting it in your calendar and checking nearer the time. Last but not least, there is a recent addition to the Canva courses – this time it’s Paisley for Business Gateway Renfrewshire – tentatively slated for March 8 at 1:30pm in InCube. This has just been confirmed today and will be added to the Business Gateway Events system in due course (pun intended). So if you’re interested in attending, do keep an eye on the BG Renfrewshire course area or follow their FB page to be kept up to date. Or call them up to book on. Just a final mention of one other workshop coming up this week for Business Gateway Ayrshire – it’s Blogging for Business. You can book this Valentine’s Day course here. The course has also just been confirmed for Paisley on the 15 March at 1:30pm. Again keep an eye on BG Renfrewshire’s events if you’re interested in that one too. That’s about all that’s on the BG courses on the books at the moment. The rest of the time is spent doing one to one training with a wide variety of clients across the Central Belt. Feel free to connect with me on the Thea’s Things Facebook page. Also please check out my latest t-shirt designs on my Design-A-Day 2018 over on Redbubble. If you would like any one-to-one training then please feel free to reach out to discuss how I might be able to assist you on 0141 416 1492.